This was the longest driving day, about 8-and-some-change hours worth of driving, along with 2 more hours worth of numerous stops and traffic/construction issues in Dallas. Dave slept 9 hours Friday night. He asked that nothing wake him up — neither alarm clock nor my noise — so I let him sleep. Dave slept so much he accidentally opened a packet of salt for his coffee at breakfast in the lobby.. Then he lost a little tub of creamer into his second cup. Of course, this was all just signs that he really needed coffee! 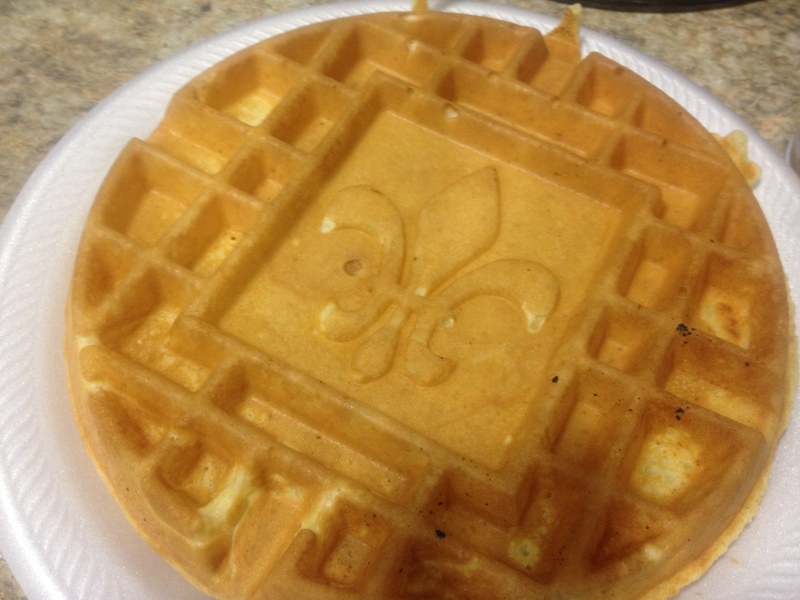 I enjoyed a Louisiana fleur-de-lis waffle! 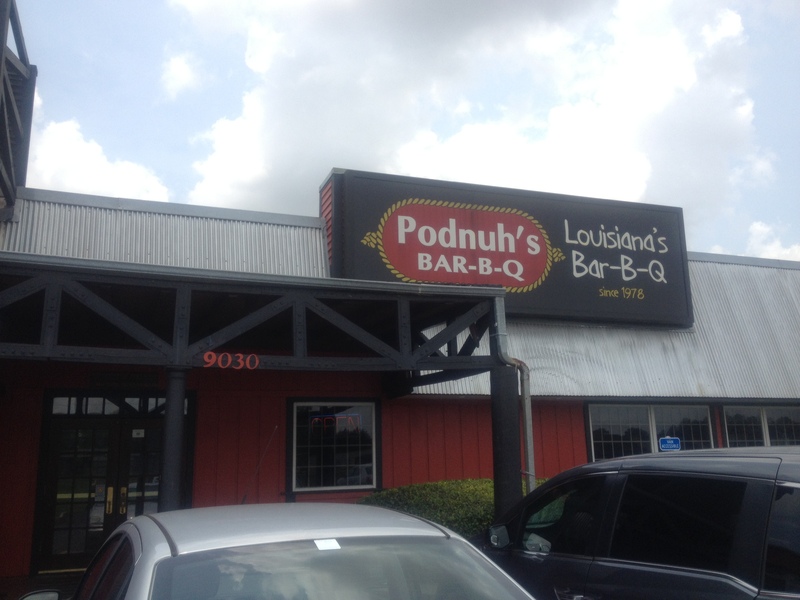 Louisiana Lagniappe. Complimentary breakfast at the Evangeline Downs hotel. He awakened at 8am and we didn’t hit the road till about 9am. We weren’t worried, we had nothing else to do except drive drive drive, right? I-49 is pretty quiet. I’d made this drive dozens of times when Dave and I lived at Fort Polk. Occasionally we’d be entertained by a couple of cattle running along the shoulder, or we’d admire the beautiful rice paddies with the water glistening in the sun. But if none of that is going on, it takes a lot of energy to keep one’s eyes on the road. Dave and I had a pair of walkie talkies. For some reason, they weren’t working well at speed. Dave discovered that they worked when we were at gas stations, in parking lots and in slower traffic. But for some reason, they act as though, when you’re going 75 mph, the car is traveling faster than the signal or something. Podnuh’s BBQ, home of smoked macaroni and cheese! I sat on a bench in front of the store with Howie, while Dave went in for take-out. Then the two of us ate BBQ sandwiches on the front porch; even though it was in the 90s outside, it wasn’t too bad in the shade. 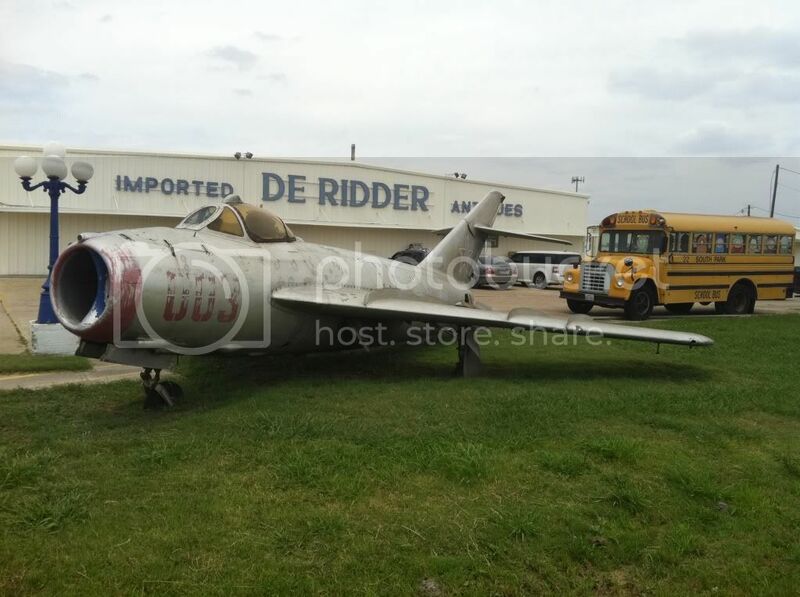 In Fornay, TX, which is west of Dallas, I spied this old MIG-17 sitting in front of an antique market. I didn’t take a picture, but some Googling found me a picture of it. Dallas interchanges can get pretty high. 50-60′! I learned this when I made a wrong turn…at the I-635 and I-35E interchange, I was blindly following my Waze app and it told me “Exit right” but it was messed up due to construction. 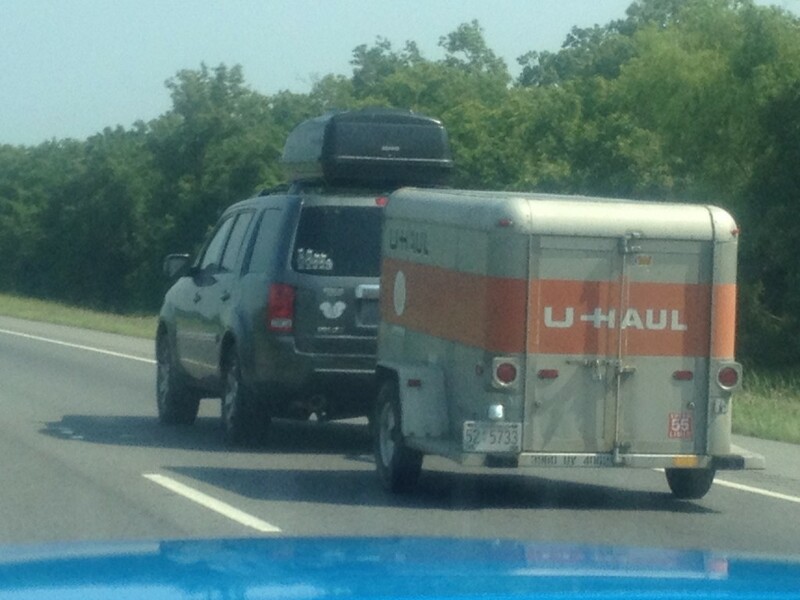 So I headed south into Dallas…oops. It was easy to turn northward and continue on. It was near Dallas that the Ford Mustang thermometer (which I think runs a little warmer than the Honda’s) registered 101F. After more strained debates through our crappy walkie-talkies, Dave took the lead. I snuck a picture…shhh, don’t tell him! I love this truck! Did I ever mention that? As we approached the Oklahoma state line, we agreed to pull over at the Welcome Center for a break. Unfortunately, the exits for the welcome center and a giant casino at the border get all jumbly…we accidentally exited at the casino. (Remember that Dave was in the lead at this point). Because casinos employ experts in keeping customers from ever leaving their premises, it was a chore to get back on I-35…and we ended up unable to get to the Welcome Center at all. Well played, Winstar World Casino. We passed through Moore, OK on I-35. Heartbreaking. Our hotel, a Residence Inn — which we like because they take pets and don’t require them to be crated when alone in the room, was just a couple of exits north of the tornado’s destruction. We rolled in around 7:15pm and were grateful for a restaurant and movie theater nearby. Another day of driving down. Meanwhile, I had to mentally prepare myself for the desert driving that was coming up. I’d never driven farther west in Texas than Abilene. 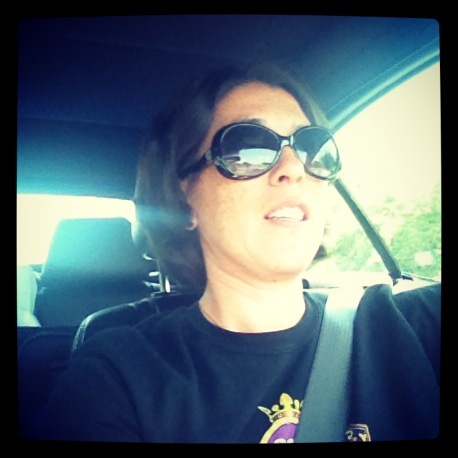 I’ll close with this “selfie” I took of myself while sitting in traffic near Dallas. This was my Mustang day…the iPhone is mounted to the vents so it was just a couple of taps to take this picture.